and how that connection reinforces the truth of the Catholic Faith. Here are two books, covering what at first sight are unconnected topics, in which leading figures in their respective fields explain how each is consistent with Catholic teaching. First, Modern Physics, Ancient Faith by Stephen M Barr. This is the best book about science and faith that I have ever read, bar (if you'll forgive the pun) none. It is often supposed that science and faith are in conflict with each other. I have found that both people of faith and people who do not believe in God can hold this erroneous view (which in Christians leads, for example, to an irrational suspicion of science, of the industrial revolution and of modern medicine; which in turn reinforces a false view of religion by non-believers that it is simply superstition that rejects science and reason). In this book Prof. Barr, who is a research physicist, lucidly explains how the conflict is not between science and faith, but between faith and the philosophy of scientific materialism. (Scientific materialism says that only science which is an investigation of the material world, can demonstrate truth). He is not the first to explain this, although the book is worth reading just for his clarity on the subject. It is when Professor Barr goes on to explain advances in physics since the turn of the 20th century that this book becomes most interesting. He describes how these advances are consistent with traditional ideas about the cosmos as articulated by the Fathers of the Church in a way that classical physics was not. (Classical physics broadly speaking is the physics from the time of Isaac Newton up to the end of the 19th century.) Also, as Barr explains, the advances that left classical physics behind, formulated by figures such as Albert Einstein and Nils Bohr,actually undermine traditional scientific materialism as a philosophy. He considers about half a dozen developments, looking for example at Big Bang and quantum physics, and explains in layman's terms what characterizes them and then demonstrates how they reinforce the Faith of the Church Fathers. Modern Physics, Ancient Faith is very clear and readable. If I had my way, I would make Barr's book part of the core curriculum of every general Catholic education. Second is an introduction to a form of free market economics called Austrian economics by the economist Harry Veryser. 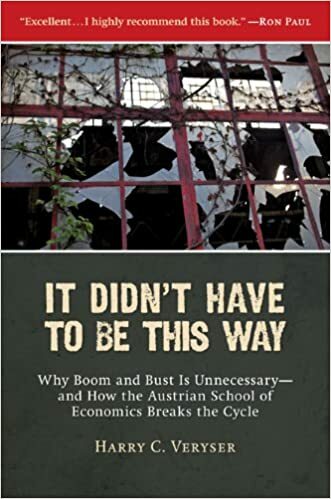 His book is called It Didn't Have to Be This Way: Why Boom and Bust is Unnecessary and How the Austrian School of Economics Breaks the Cycle. Professor Veryser - head of the Masters program in economics at Detroit Mercy University. Veryser is also a committed Catholic and he explains also how in his view this economic system is consistent with a Christian anthropology, is build upon the understanding that a flourishing culture of faith is important for society, and if introduced will allow the human person to flourish in accordance with Catholic social teaching. I wrote a review of Veryser's book, here, which also appeared in the journal of faith and culture, Second Spring. So, aside from the obvious - two Catholic authors seeking to demonstrate how their respective fields are in accord with the Faith - what is the connection between these two books? The answer, I suggest, lies in the way that each is describing how a predictable order emerges out of a series of a large number of individually unpredictable events. So in the case of Veryser's economics: he describes how even though the individual decisions are made by human beings and are subject to free will (and in the ideal, free will properly ordered to our supernatural end) and as such are not predictable by science; when the economy as a whole is observed a describable order emerges. So the patterns of society as a whole, even though it consists of the aggregate of this network of personal relationships and choices that are based in free will, do follow a consistent pattern of cause and effect. It is a paradox - that although the component decisions and relationships of which society and a culture comprise do not conform to any describable order, the aggregate effect does, provided that you have enough events for statistics to apply. Veryser does qualify this. In the 19th century, when this pattern was first noticed, there was a tendency to treat the field of economics as a precise science. This stream of thought in economics persists to this day, taking the parallels between classical physics and economics to far, he says. According to Veryser, although general trends can be predicted well enough to allow for prudent implementation of economic policy, economics is still not a sufficiently precise science to enable the effects to be quantified mathematically in the way that a scientific theorem quantifies the natural order in the material world. In short, while we can predict what will happen we cannot say exactly how much. This over reliance on mathematics in economics was a mistake that has had disastrous consequences. Part (not all) of the cause of the economic collapse of 2007-8, Veryser tells us, was due to the fact that some economists (from Milton Friedman's Chicago school of economics) put too much emphasis on the mathematical predictability of the economy and this encouraged bad investment decisions. When these investments crashed, the economy as a whole was so dependent upon their viability, that it crashed too. Veryser suggests that economics can't be treated as a science because such an approach ignores the human aspect of free will and the cultural milieu that influences those decisions. Austrian economics works so well, he says, because it does take these into account. I suggest that the problem with the Chicago school was not that it tried to apply scientific principles to the economy as a whole, but rather that it relied an antiquated scientific approach to quantify its predictions. It looked to 19th century classical physics as a model of analysis; rather than looking to quantum physics. In order to explain why quantum physics might have relevance to economics, I will have to try to explain first how quantum physics is different from classical physics which was the established scientific orthodoxy from the time of Newton until the end of the 19th century. In classical physics, the assumption had always been that all matter conforms to exactly the same physical laws, no matter how large or small those pieces of matter are. Over time, as scientific knowledge progressed, the horizon of observation and analysis became smaller and smaller. What began as the observations of large scale bodies, for example planets and stars in the sky, became focused as well on matter broken up into its constituent parts , for example atoms, and sub-atomic particles such as neutrons, protons and so on. Provided the particles being observed weren't too small then it seemed that this assumption of the universality of the laws of physics seemed to hold. However, as the analysis became finer and finer and smaller sub-atomic particles, such as quarks, were discovered, things started to break down. It was discovered that the constituent parts of which all matter is made don't seem to behave in exactly the same way in isolation as the large scale bodies that they comprise. Quarks seem to follow a whole new order. I can remember when I was at school at around 16 years old being struck by the strangeness of this when learning about the pattern of decay of radioactive atoms (by which an atom splits up to form two or more lighter elements and simultaneously releases radiation). My teacher told us that when you look at a sample of uranium the rate of decay of the whole lump can be predicted quite accurately (by calculating something called a half life, which is a set time that it takes for the mass of the lump to reduce by half and is always the same for any radioactive element). However, for all the certainty associated with the activity of the sample as a whole, if you were to consider any one atom within that sample, things look different. If we were able to select one particular atom for consideration we would have no idea at all when it will decay. All we can say is that at any moment there is a probability of decay occurring. Once you know this probability, if you have many many atoms then you can say that statistically, a proportion of them will have decayed at any given time. So for example, if the chance of a single atom decaying is in a given time period is 1 in 10,000, and we have 1,000,000 atoms, we can say that it is likely that in that time period, 100 ( ie a 10,000th of a million) atoms will have decayed. We still can't predict which 100 atoms it will be , but we can say it is likely to be that number. The statistics become more accurate the greater the number of atoms in the sample. So by the time we get to a visible lump of uranium which will contain trillions and trillions of atoms, the rate of decay of the whole lump can be predicted quite accurately. This is the paradox of quantum physics, the pattern of behaviour at the sub-atomic level is different from the order that emerges when you have trillions of those particles together and you look at the aggregate effect. The aggregate effect conforms to classical physics - that is on the large scale classical physics still holds; but the behaviour of all the smallest particles within it seems to follow a whole different pattern, even though it is these particles that are contributing to the aggregate effect. The degree to which the body exhibits quantum or classical behaviour depends upon the number of particles present. For a single particle it is pure quantum behaviour, as the number of paticles increases you have what is called an 'emergent order' in which the mode of behaviour steadily becomes closer to classical physics. If the sample is large enough, many trillions, then the statistics are more accurate and classical physics holds. Between the two extremes therefore, there is a transitionary stage of partial quantum and partial classical behaviour. Furthermore, and here is what is all the more amazing for me, the pattern of behavior of the sub-atomic particles when purely quantum, is mathematically inconsistent with any possible mechanical process. So its not just that we don't know what causes that radioactive to decay when it does; we can say that from the mathematical pattern of that decay, the cause is not consistent with any conventional mechanical cause as one would expect to see in natural order. This means that the quantum event, for example the decay of an atom, might be spontaneous, or it might have a cause that does not originate in the material world. In other words when we get down to the first individual events in the chain of events (that collectively conform to classical physics), we see something that has a pattern that might, hypothetically be caused by something non-material. This non-material cause could, hypothetically, be something spiritual such as a human will, or a divine will; or it could be something else totally different, as yet unknown, perhaps even unimagined, and still to be discovered. If the cause were spiritual, then it allows for the possibility that the motion of electrons in the brain is the result of the thought connected with it (as traditional anthropology which sees man as body and soul would suggest) and not the cause (as a secular materialist would insist). Another possibility is that the divine will, God, really could be the First Cause for all physical processes. We should take care, however, in stating this that we do not to fall into the God of the gaps error. Saying that something is consistent with the existence of a will, either human or divine, is not the same as saying that it proves that it is so. Future research might confirm this either way; but as it stands, quantum physics does cause big problems for the traditional secular materialist viewpoint which relies on classical physics alone to prop it up. Amusingly, Barr describes how quite a few scientists who hold to secular materialism have responded to this challenge to their 'faith'. Rather than acknowledge the possibility of the legitimacy of hypotheses that there is a God, atheist scientists come up with a whole string of just as unverifyable scientifically, and far less credible hypotheses such as the multiple universes (if you want to understand more about this you'll have to read Barr's book). Now back to Austrian economics. It occurred to me as I read Veryser's book, that Austrian economics is, contrary to what Veryser thought, consistent with science. Veryser was right in pointing out that its methodology was not consistent with 19th century, classical science; but what he did not realise, perhaps, is that it is consistent with quantum science. We can see that once we adopt a quantum physics view of science, we can see that both inanimate matter, and human society exhibit the same pattern of random behaviour at the individual or quantum level, with an emergent order when the aggregate effect is considered. However, the sample has to be large enough for the statistics to work and for the mathematics to apply. The population of the whole world is a tiny fraction of the number of atoms in even a small sample of uranium so we never see the full equivalent of classical science in a human society. The number of human decisions made in a typical economy seems to be sufficient only for that order to be partially emergent so that general trends are predictable, but not sufficiently so for precise mathematically calculation to be applicable. This was the problem for the Chicago economists approach, the sample size just wasn't large enough. If I am right and there really is a parallel between Austrian economics and quantum physics, and each is consistent with the Faith in the way that Barr and Veryser describe, it opens up, potentially, a natural connection between the social sciences and the physical sciences in which a free man has a place to flourish. It is all hypothetical at this stage (and who knows where scientific progress will take us next) but for the moment at least it seems that deep down in the heart of all matter there is a place the division between the natural and the supernatural; and the spiritual and the material is blurred. This being so, the Christian has no need to feel that science and its daughters, technology and industrialization are somehow in conflict with an appreciation of the human person as body and soul. It is classical science that caused this conflict. It is not just Christians who have agonized over this. For example, ever since the 1920s there has been a whole genre of films based upon a sense that a society is too technology driven and as a result is impersonal and inhuman. These films portray a future society in which scientific materialism has its day and man is reduced to an automaton. Typically the hero is the passionate man whose love for a woman bucks the trend and brings the whole system of mechanical society crashing down. Earlier cultural movements have emerged from this same pessimism. The arts and crafts movement looks back to the halcyon days of the beauty of a pre-industrial age and concludes that technology and industrialization are the cause of modern ugliness. Both of these cultural expressions have at their roots a suspicion of scientific progress and a belief that it always suppresses the human spirit and stultifies a culture of faith and beauty and both, I would say that in this respect both are wrong. The answer is not to remove modernity, but to transform it, make if fully what it ought to be. It seems if we want to have a free society, that the answer is not to eliminate or be suspicious of science, rather we should welcome scientific progress and seek to understand it more deeply so that it is in harmony with Catholic social teaching - the two are not mutually exclusive. Such a society will in turn inform technological and industrial advances that respect man's freedom; and such a society will also engender and support a culture of faith and beauty more powerfully than ever before. As I argue in my book, the Way of Beauty, the greatest influence on the culture and the creation of community in society is our attitude to God, and the greatest influence on that is our worship (and not capitalism, industrialization or mass production). To the degree that the culture is informed by faith, then the free economy, such as that advocated by Austrian economists, will allow a greater flourishing of man. How can we move towards this society? The answer lies in cultural transformation even before the changing of legal, political or economic systems (although I am not against attempts to change these too). It is in the Eucharist, at the heart of the sacred liturgy, which is the node at which the material and the spiritual, the natural and the supernatural, human and the divine, and the eternal and the temporal all meet at the deepest level and in the most profound and harmonious way. It is a supernatural transformation in Christ, through a d full and active participation in the sacred liturgy that we are transformed and become people who through our daily activity transform the culture around us. One can't help feeling that the mysteries that recent developments in science seem to be hinting at are fully encapsulated at that point and the fullest knowledge of them is only grasped through a gift of divine wisdom. The liturgy is the source and summit of human life and that includes, it seems, the greatest source of inspiration for scientists, social scientists and economists!